To celebrate the first anniversary of Life of a Travel Czar, I will be reblogging some of my first posts from this time last year. Plus I am in the process of changing most Pages on the website into Posts for consistency! #Enjoy and thank you for your support! Here is my second post! 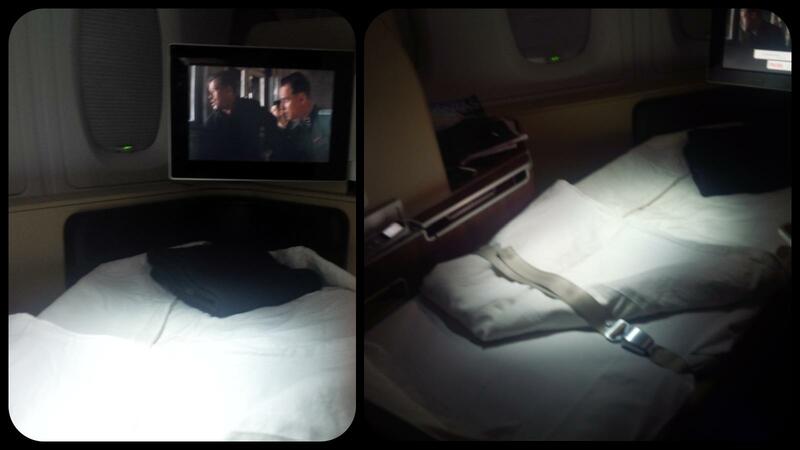 Well, so here I am onboard the A380. I race through the airbridge to get acquainted with my seat. We are going to be spending 24 hours together, so its important to build a rapport. I am then greeted by my lovely host, Ann. She offers me a champagne, Pol Roger Sir Winston Churchill 2000. 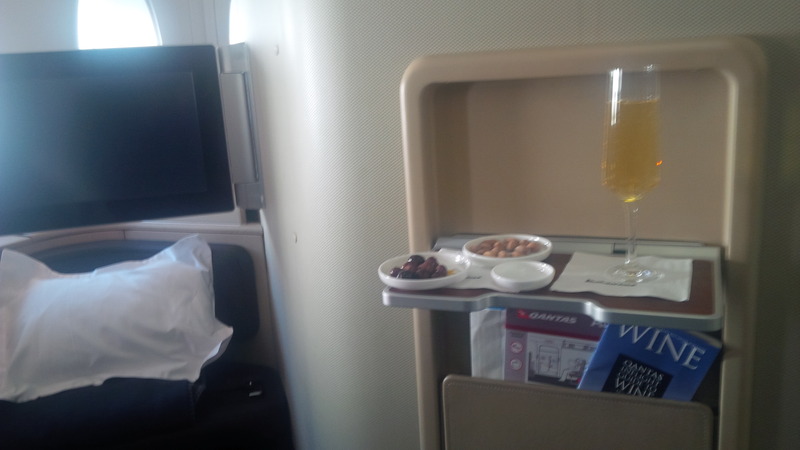 There are also some wonderful olives and almonds which provide wonderful companionship to the champagne. The champagne bubbles burst on my tongue with flavours of quince, cinnamon and brioche creating a little party inside my mouth. I then get changed into my wonder PJs. I love the new design, it’s more slick and bad boy compared to the classic design they had last year. Anyway, shortly we are in lift-off, the views are simply breathtaking but being the restless kid that I am, I stare aimlessly at the seatbelt sign waiting for it to be switched-off. 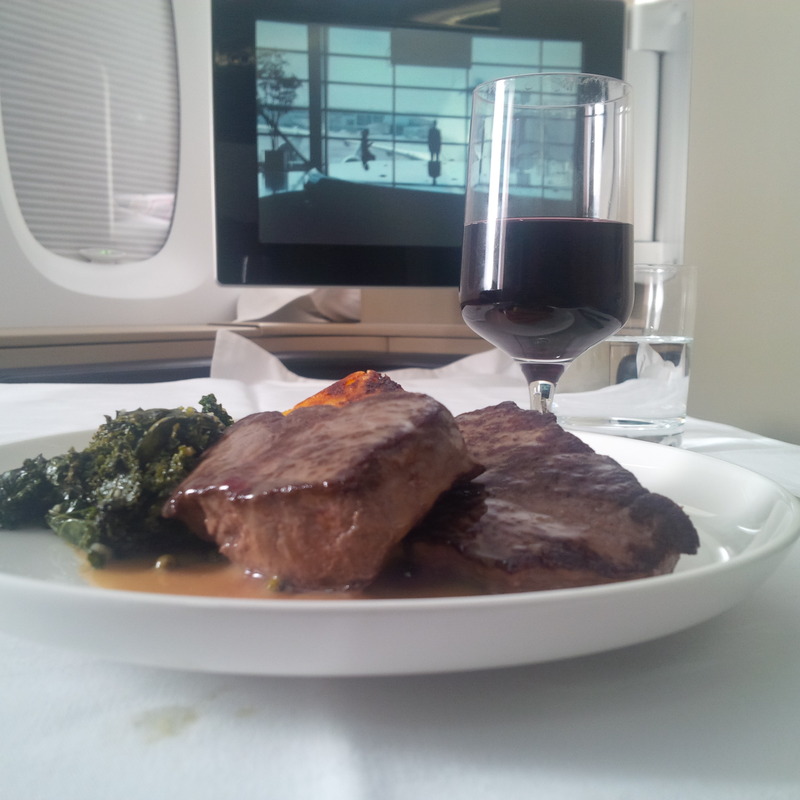 Once we are cruising at altitude, the lunch service commences. They have a tasting menu or the À la carte. I break with tradition and go À la carte. While I would claim this is as my new “change is good” motto, I was actually drawn by the venison steak. Don’t think I have ever had game meat at 30,000 ft.
We start with some canapes and I have lovely french onion soup to get the taste buds going. 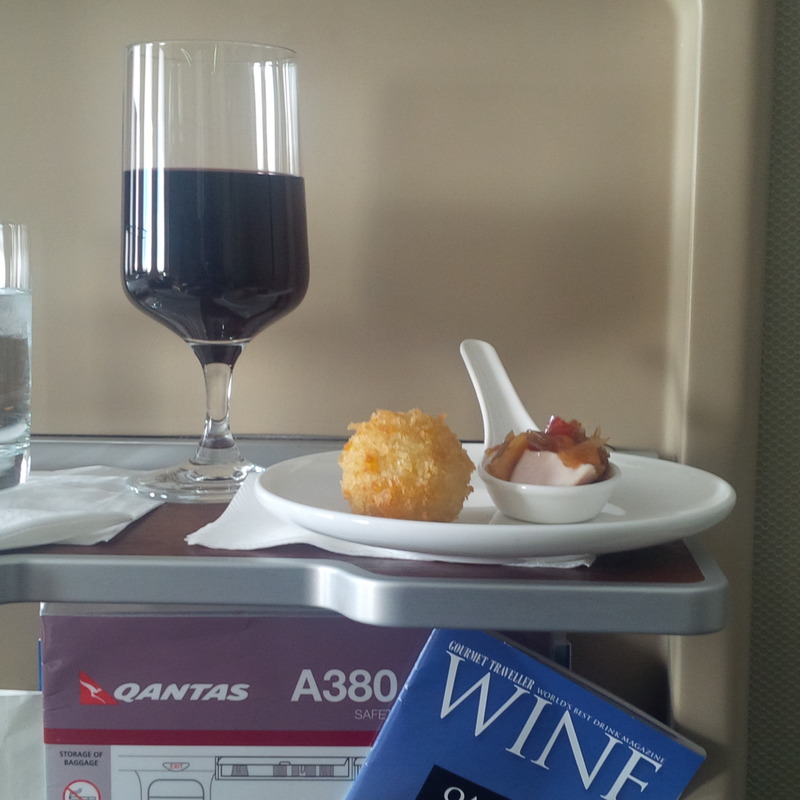 The wine list is good with a range from all over Australia, but I can’t seem to go by my WA wines. 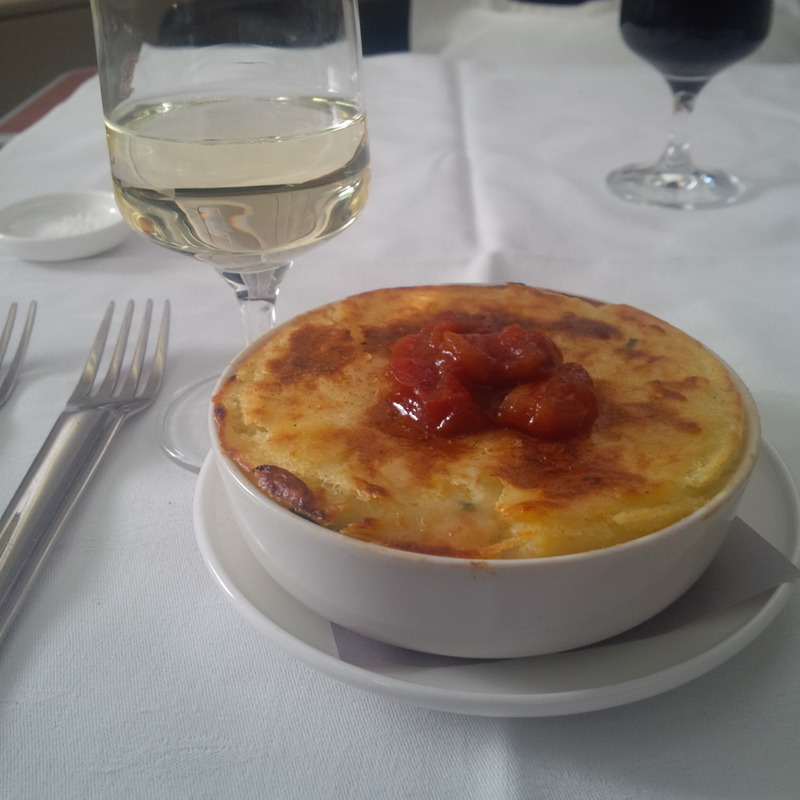 The Cape Mentelle Sauvignon Blanc Semillon (2011) is paired perfectly with a Salmon, Prawn & Potato Pot Pie. Tender pieces of flaky “melt in your mouth” salmon pieces complimented with the firm prawn meat layered with creamy potato. I slouch in my seat feeling content and wash down every last morsel with the Cape Mentelle. Now comes the Venison. Firm succulent venison steaks, with that gamey taste which tingles your taste buds about 15 seconds after you’ve consumed it. The polenta is amazing, drenched in peppercorn sauce, it just crumbles in your mouth. 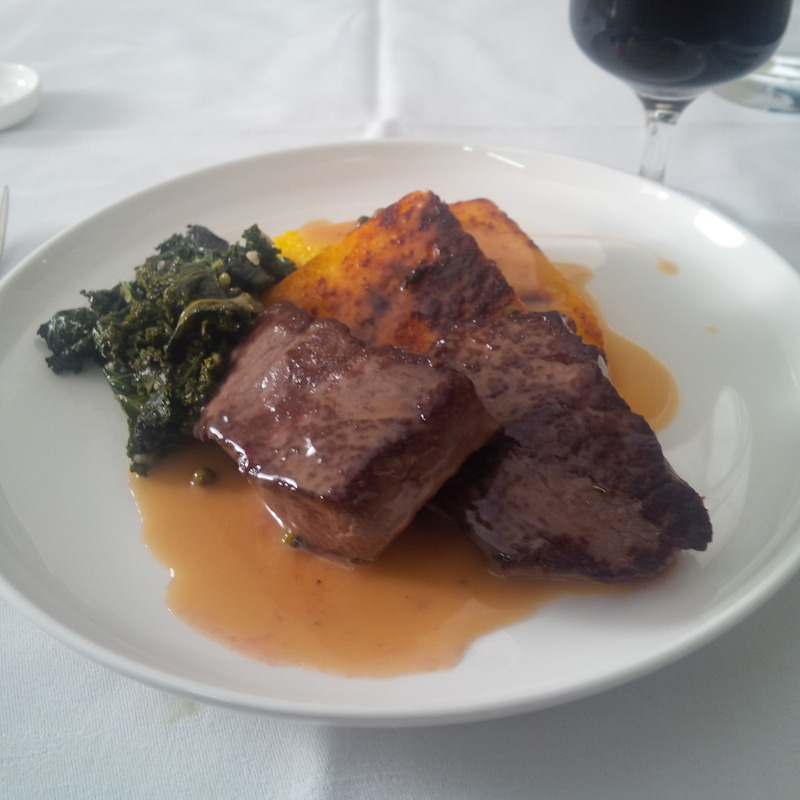 The kale was well done too, although if I could have the indulgence of one lonely complaint, I thought it was a little lost in the dish. This dish was paired with a glass of Cullen Diana Madeline (also from Margaret River). It was perfection… the great depth and intensity, with a mix of berry and spice flavours swept of my feet again. 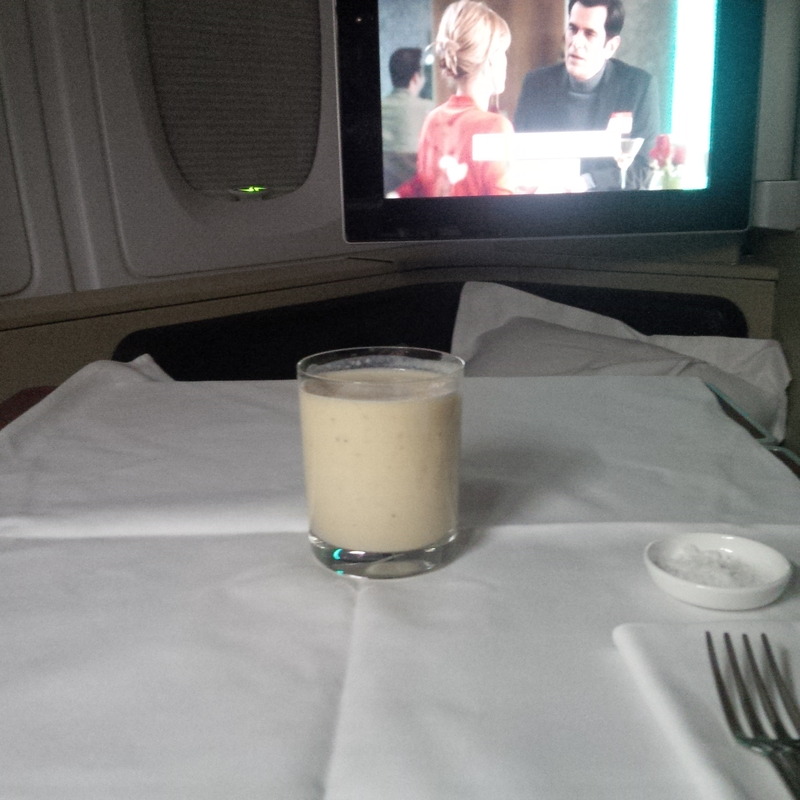 I rest post my dinner with gin and tonic and watch Up in the Air! A fitting movie, which pretty much sums up my hobby. Pretty soon (well more like after 14 hours of flying) we hit the tarmac in Dubai. The Emirates terminal in Dubai is amazing. 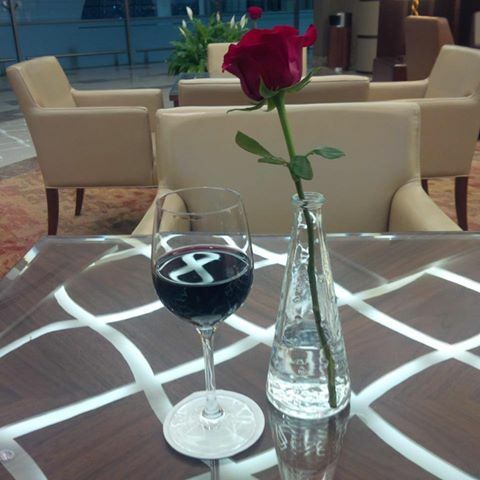 I hop off the aircraft and make my way to the First Lounge. It’s huge and the service is fantastic. 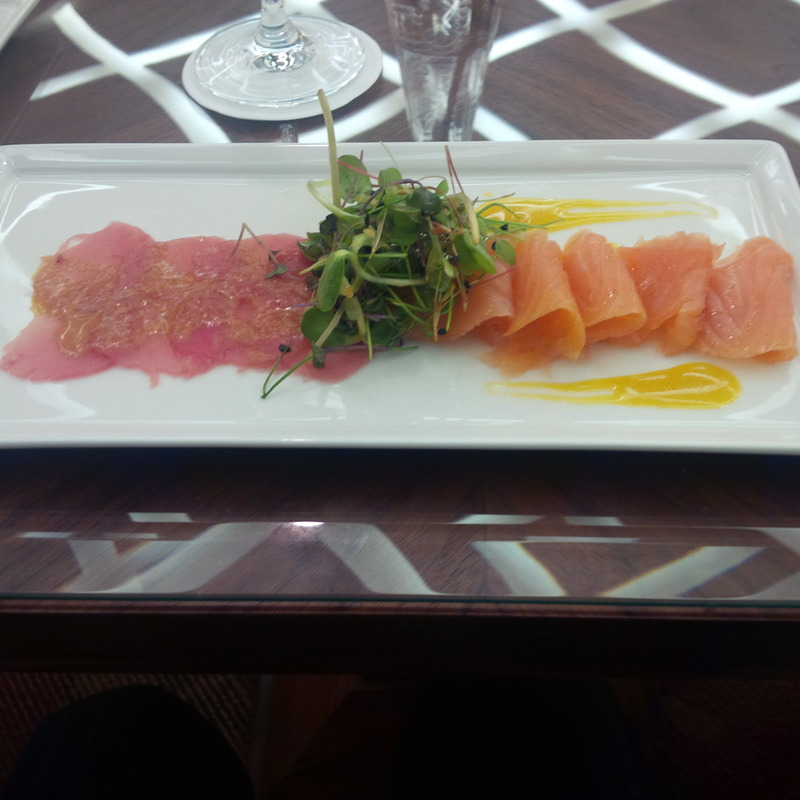 I knock back a glass of Torbreck Shiraz and then tuck into some Salmon and Tuna carpaccio. It’s supper at its very best. The time in the lounge is just too short :(. The boarding calls begin and I am off to my gate. The next leg is a mere 7 hours. Richard de Crespigny (the legendary pilot who steered Qantas through a midair disaster a few years back) is the captain for this flight. He explains some interesting facts about the A380. Each of its engines are worth $20M each, the engines contain 30 elements from the periodic table and during take-off for each flight the engines will breath more air than any of us would in a 100 year lifetime. Anyway, I can tell I’m boring you. Now the fun part, supper arrives! 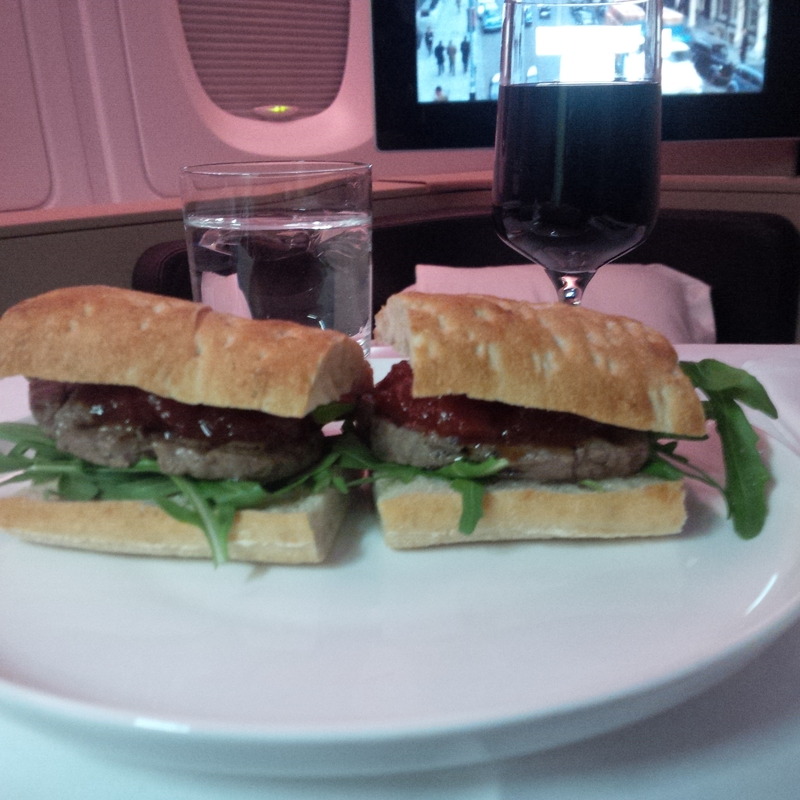 I have opted for the Qantas Signature Steak Sandwich. I first tried this at the age of 21, but it still takes my breath away every time I have it. I settle back in my seat and watch a biography of Rupert Murdoch. He was one of my childhood idols! I just love the story about how he turned a small Adelaide based newspaper into a global media empire. I am now feeling knackered and ask for my suite to be converted to a bed to get some much-needed shut-eye. I sleep like a baby. Then I awaken from my rest and my host notices, so she walks up and tells me breakfast will be served shortly. After speaking to her, I realise I have bed hair and she saw me all dishevelled (what a disaster). I race of to the bathroom to fix my hair and to apply some moisturiser to give my skin that elastic look (so not happy with myself). The saving grace is when she walks by to restore the suite, she notices me and sees my wannabe slick hairdo, so all is well in the world again. Then breakfast is served. 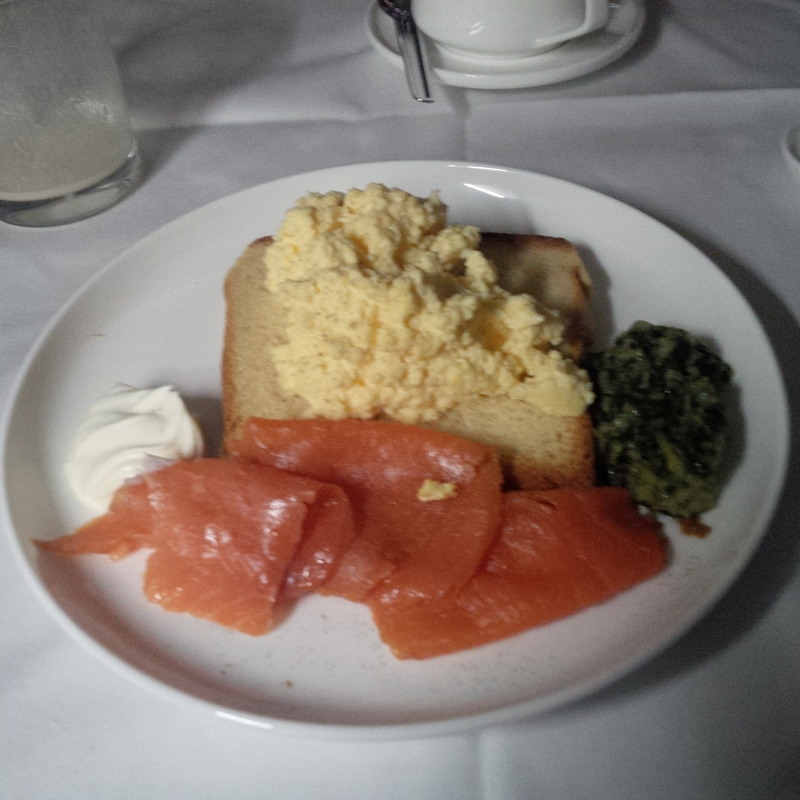 There is a banana energiser drink, scrambled eggs on salmon with a brioche toast. Simply amazing!!! Velvety scrambled eggs, melt in your mouth salmon with that salty tang and the crumbly sweet crumbs of the brioche. Can’t think of better taste and textures to start my morning. Then the plane hits the tarmac and I wave goodbye to my hosts and make my way into Heathrow Terminal.